It is indeed the season of red and green. There is that sense of pride in the air because of Victory Day but there is also that light-hearted joy because Christmas is here! Both these green and red occasions of the month make December very unique and what better way to make Christmas memorable than with food. Christmas is inherently warm and fuzzy and friendly. You forget about calories and dig into those prohibited cakes and pastries which might wreak havoc to that well maintained waistline. To aid you in this sweet mischief we have picked the brain of the passionate baker and founder of 'Sweet Sensation', Deneb Latif. The perfect Christmas dessert table is one which is full of savoury cakes, pies, fudge, brownies and cookies, says Deneb. There is a lot that you can do with the Christmas dessert table, you can go traditional and stick to plum cakes and mint pies or you may venture out this year and add a twist to the table. Traditional Christmas desserts, being highly inspired by the cold December weather in the West, are full of dried fruits and nuts and warming spices such as nutmeg and ginger. You may stick to that safe route and fill up the table with a nut-filled Christmas pudding, some ginger cookies and a jam-filled Yule log or you may experiment with new ideas. “Why should cupcakes always be sweet?” asks Deneb, “You can put a spin on things by putting the flavours of a ginger cookie in a cupcake and you have a sweet and spicy cupcake.” She suggests trying a maple or honey glaze for such cupcakes. If you are not into the heavy cake scene but still find Christmas unfulfilling without some dose of chocolate, try a light chocolate sponge cake or even a chocolate cheese cake, topped off with nuts. Want to add a twist to this as well? Toast the nuts with some salts and surprise your guests with that mouthful of salty and sweet sensation. Other cake ideas for Christmas can include a carrot cake with a generous helping of dried and glazed orange peels. “You can make the dried peels yourself since oranges are widely available this season,” says Deneb. "Just leave the orange peel out for 4-5 days and glaze in sugar syrup before using it as decoration”. A lot can also be done in the cookie arena which too is so Christmassy. Dried cranberries, available in the Gulshan 1 market, can be baked into a delightful cake or baked into fruity cookies. The traditional oatmeal raisin cookies can be made with mueslis which too are widely available and come with the dried nuts and fruits already added. If you want something completely out of the box, try zucchini bread, which can be eaten with the main course or as dessert, or an eggnog cheese cupcake. 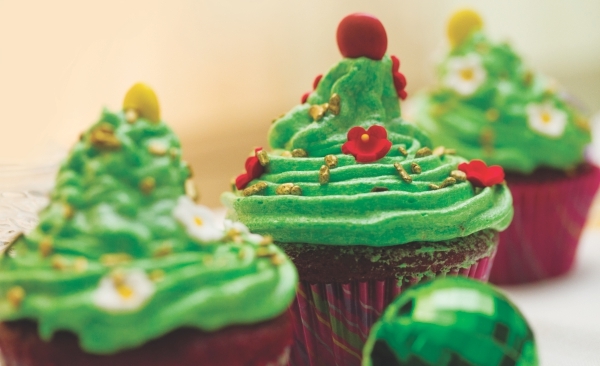 Eggnog keeps the Christmas spirit intact while the cupcake form adds originality. You can serve this with some basic nut brittles or sugar cookies. Both of these are very easy to make and you can also involve your kids in the decoration process. And that's your perfect Christmas desserts table. A must-have chocolate cake, some buttery cookies, a fruit pie and some creative additions along the sides. You can get baking yourself or ask Sweet Sensations to help you with your warm and fuzzy Christmas desserts table. Candles create instant atmosphere -- their glow makes an intimate and comforting sphere, with a touch of romance and a sense of warmth. There is something about the flickering golden flame that transforms a humble supper to a deluxe dinner -- the enchanted circle of light encourages people to look at each other anew, to appreciate and listen with long forgotten fascination. Candles first originated in the 13th century. In Paris the members of the guild of Tallow Chandlers went from house to house making candles. In the 15th century, a candle-maker named de Brez, of Paris, revolutionised the business by inventing the candle mould. Gradually the candle-making process improved dramatically for its illuminated effect and also for its functional demand. In the mid-19th century, candle-making companies owned coconut palm plantations in Sri Lanka and could produce a hundred tonnes of candles weekly. In 1850, paraffin wax appeared, and in 1857, in combination with stearin and the braided wick, it finally resulted in bright, affordable candles. The year-end is looming around the corner. Our glorious Victory Day and the season of weddings and Christmas all combine to create a festive mood during this month. To decorate and enchant your guests at some of these celebrations, there are many different types of candles for different occasions. It's what December brings. Let's make this Christmas a special one for all to remember. Dark, rich, baroque colours characterise Christmas in the city. The classic combination of red, green, and gold forms a festive theme upon which to play with variations. 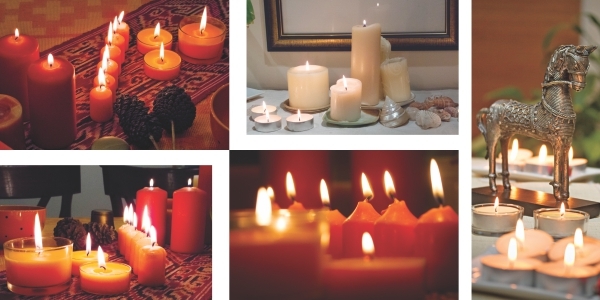 We can use simple, casual, natural-coloured candles for home decoration. If you want an innocent Christmas decoration, many natural ingredients are commonly available. You can collect some bushy plants from your garden, some dry plant's root or trunk, spice and pomanders from your kitchen, and ribbons from your sewing box. Stick to uncluttered arrangements in muted colours, using natural textures to lend interest and allowing the subtle light of candles to add a warm glow. Such as a ring of oasis, crammed with the remnants of autumn richness -- berries, mosses, bark and pinecones -- makes an attractive roosting place for four advent candles, one to be burned on each of the four Sundays, before Christmas. There is a natural connection between candles and Christmas time which goes back to pagan midwinter solar observance; the turning point of the year at its darkest nadir celebrated defiantly with lights and evergreens. 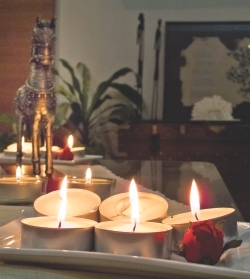 Candles are synonymous with romance: their soft, glowing light suffuses the practical interior with warmth and mystery. There is something enchanting about the flickering light of the candle that draws two people together. Scented candles add to a general feeling of luxury; choose rich, heady fragrances such as rose, jasmine, or orchid or the earthy wood scents of cedar or sandalwood. This is the opportunity to use your best china and finest white lace tableware along with plenty of muted antique gilt. If you want to arrange a party for the new bride and groom you can add dining decor with golden stick candles with antique stands. 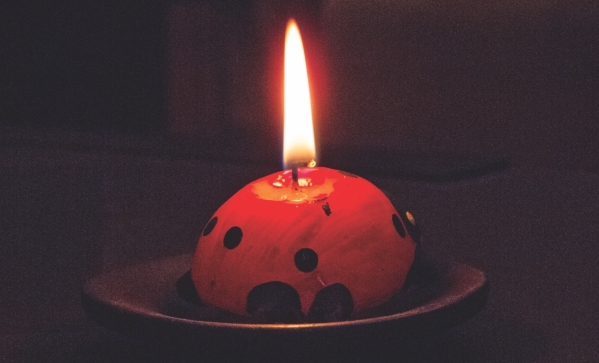 Besides shedding a warm and flattering light, candles can also fill a room with fragrance -- scented candles even burn away noxious smells, and outdoors, citronella will keep mosquitoes at a distance. There is a huge choice of fragrances -- some fresh and floral, some musky and oriental. Floating candles are often scented, their broad shapes and the cool water prevent the molten wax from spreading into a puddle. These days we celebrate our many special days with our family and friends. Flowers, fruit, sweets and floating candles can make the corner table fabulous for parties. Indigo and spice-coloured handmade candles are commonly used in temples. Brass-holder 'prodip' or wall-hanging metal sculpture candle-holders used in Indian temples lend an emotional ambience. All Indians celebrate divali with many candles lit in their homes. African and Chinese cultures also observe special occasions with wooden sculptures and metallic candle-holders. Plain and unadorned church candles will always stand out when grouped together in different sizes. Surround them with dried leaves, garden stones, and potpourri and kitchen spices to create a natural-looking setting. In the end, I always remember to never leave candles unattended. Carefully extinguish the flame after your party. Done right, there are few things that can match the romantic, old-world class that a flickering candle provides.